Letter from the Head of Department, Rob van der Hilst. 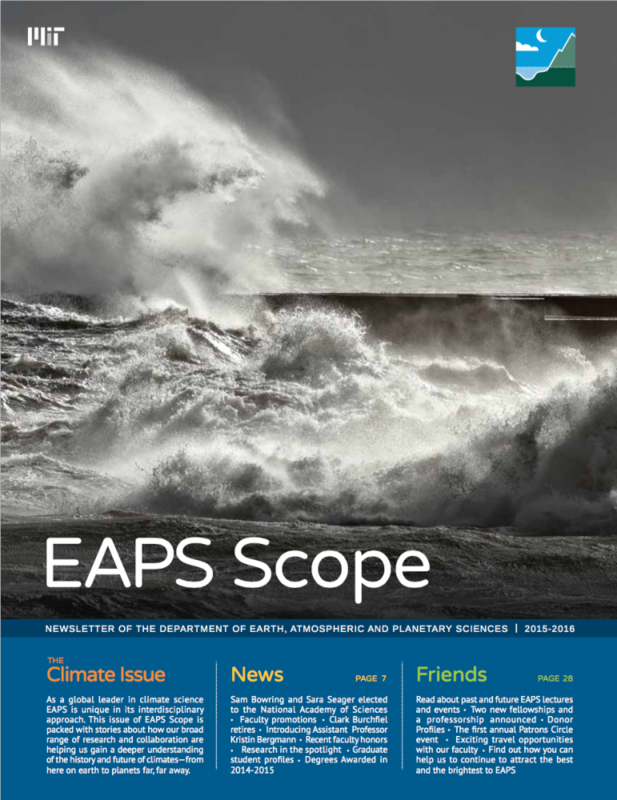 EAPS scientists are working to advance our understanding of climates and their evolution—from pre-historic to present day to predicting the future, even on distant planets—providing important data for industry and policymakers. Congratulations to Colette Heald, Shuhei Ono, and Noelle Selin for their recent promotions in recognition of their achievements and contributions to the School of Science. Bergmann comes to EAPS after recently completing a Harvard Society of Fellows postdoctoral fellowship. Kerry Emanuel focuses the study of cyclones away from policy and back on expanding fundamental scientific understanding. Professors Sam Bowring and Dan Rothman’s recent work each shed new light on “The Great Dying:” the 252 million year old mystery of the end-Permian extinction. A recent multi-institution study, co-authored by John Marshall, Alan Plumb, and Susan Solomon, reveals complicated connections between ozone, oceans, and warming polar regions. After nearly two decades struggling for approval, the NASA-funded New Horizons mission to Pluto finally reached the launch pad in January 2006. Nine-and-a-half years later the piano-sized spacecraft entered the Pluto system, revealing an amazingly bizarre planetary world. A new landslide prediction model from Dino Bellugi, Taylor Perron, and Paul O’Gorman could help communities prepare for disaster in the face of changing climate. Geophysicist Brad Hager is using our understanding of seismology and geology to find ways to responsibly extract carbon energy resources embedded underground, and to capture carbon emissions and return them deep into the earth. Earth. Planets. Climate. Life. Get to know four of our students and the breadth of thesis topics from across the EAPS spectrum of research. A recent celebration honored Professors Peter Stone and Paola Rizzoli’s ongoing dedication to EAPS and MIT through their research, teaching, and newly-announced endowment of an EAPS professorship in their names. An abiding curiosity, fostered by an EAPS mentor, inspired John Carlson to become a prominent champion for climate research at MIT. A lifelong fascination with earth sciences, bolstered by an MIT education, influenced a philanthropic investment—one which ensures a life income now and support for EAPS students in the future. Leaves behind an enduring legacy of philanthropy and service to EAPS and MIT. This year saw the induction of three new members to the EAPS Patrons Circle, with environmental interests being the catalyst for generous gifts to fund the new Callahan-Dee and Wade Fellowships. The first annual Patrons Circle dinner introduced friends new and old to the EAPS graduate student fellows and their diverse research interests.